This Giveaway has now ended! Thank you to everyone who entered!! Congratulations to Brandon S. for being the Winner! 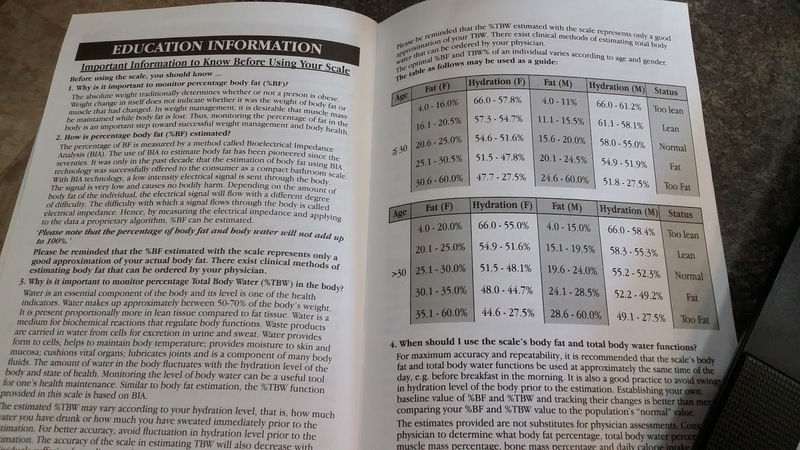 Have you ever wondered what your body fat percentage or muscle mass percentage is? 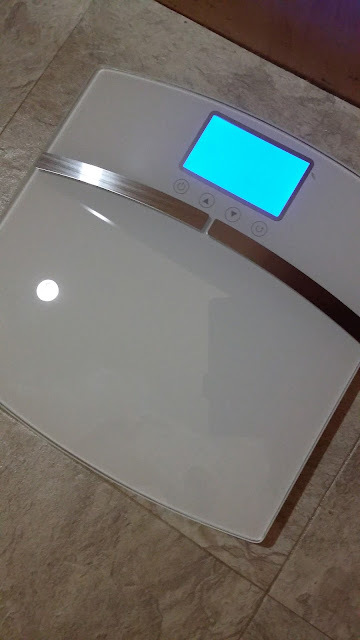 There's a bathroom scale that can tell you! 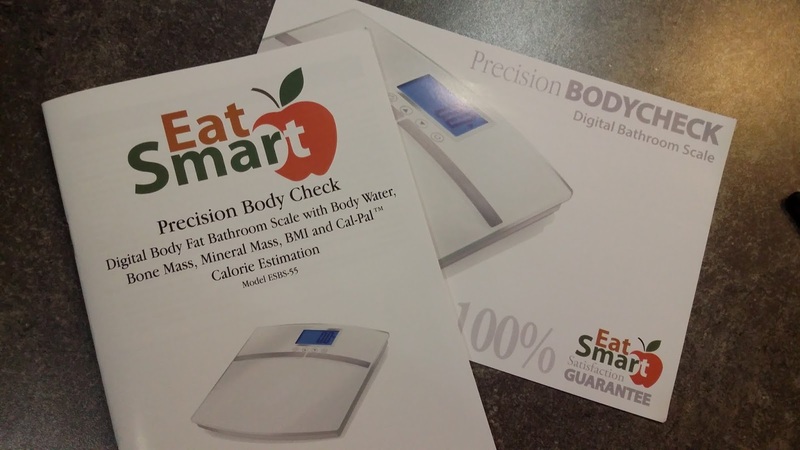 I was recently given the opportunity to try out the EatSmart Precision Body Check scale for free in exchange for my honest opinion. All opinions are 100% mine. I was so excited to try this scale! We took it out of the box immediately and tried to figure out how to use it. It came well packaged and came with 3 AAA batteries. Once we got the batteries in, we got started! It took me a couple times before I figured out how to enter the information correctly. The icons were a little confusing at first, because I couldn't tell if the figure was the "athlete" or whether it was male or female. Once I figured that out, the rest of the process was pretty easy. The EatSmart scale can hold up to eight people's information. By the time we had to enter the 3rd and 4th people's info, it was a piece of cake. To enter the info, you hit the on/off button, select a memory number (1 - 8). Then you input whether you are male or male athlete or female or female athlete. You can find out their definition of "athlete" in the instruction manual that comes with the scale. 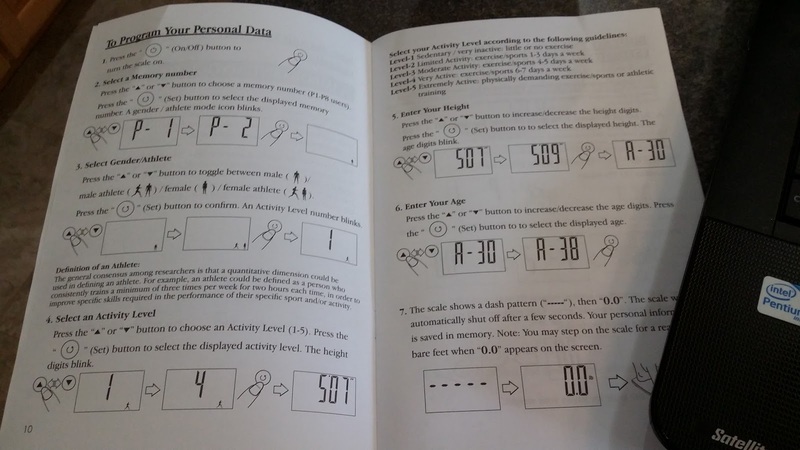 Then you put your activity level, 1 - 5, which also is defined in the manual. Enter your height and your age. Once the scale zeroes out, you can weigh yourself. The scale is only meant for people who are between the ages of 18 - 80. The scale works by Bioelectrical Impedance Analysis technology. A low intensity electrical signal is sent through the body. The signal is very low and doesn't cause harm. Depending on the amount of body fat of the individual, the electrical signal will flow through with a different degree of difficulty. *Because of the electrical current, anyone with a pacemaker or metal body parts shouldn't use it. Also, although it is safe, it is unknown the effect that it has on fetuses, so pregnant women shouldn't use it. All of the percentages in the scale are an approximation. Your physician can order tests that will be more accurate. However, I like having an approximate percentage to give me an idea of what I need to work on. According to my BMI, I am "too lean", but according to my hydration percentage, I'm "fat." That leads me to believe that a lot of the fat % is based on BMI from the weight and height measurements, but I still love having the estimates. 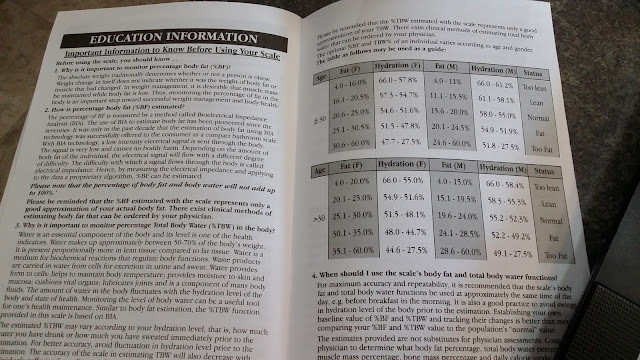 You can find out what all of the percentages mean in the manual that comes with the scale. The instructions say that results are best with clean, slightly moist feet. That part is true! I've tried it when my feet were dry~~just out of socks and it will only read my weight, not any of the percentages. If I put a little water on the bottom of my feet and then wipe it off, I'm good to go. I find it's best to just do it right after I have come out of the shower and have dried off. Once you enter each person's info, the scale remembers each person based on the weight when that person steps on the scale. If there is more than one person with around the same weight, it will give you an option of which person is on the scale. You can find the scale at Amazon. ENDED! Are you ready for the Giveaway!!!???!!! February 5th - February 21st at 11:59 PM EST. There are multiple ways to enter on the Giveaway Tools widget. Choose as many as you like and come back for the daily entries, if you wish. Winner will be chosen randomly via the Giveaway Tools form. Enter through the Giveaway Tools form below. I would love to be able to monitor my BMI! This is amazing! I am joining a gym today this would be a perfect addition to my healthy lifestyle! I learned that their scales come with a 2-year warranty & the scales are sent with a free starter set of batteries! I would love to try this scale because I am losing weight & don't have an accurate scale at home to weigh myself, so I either use the scale at the gym or doctor's office right now. 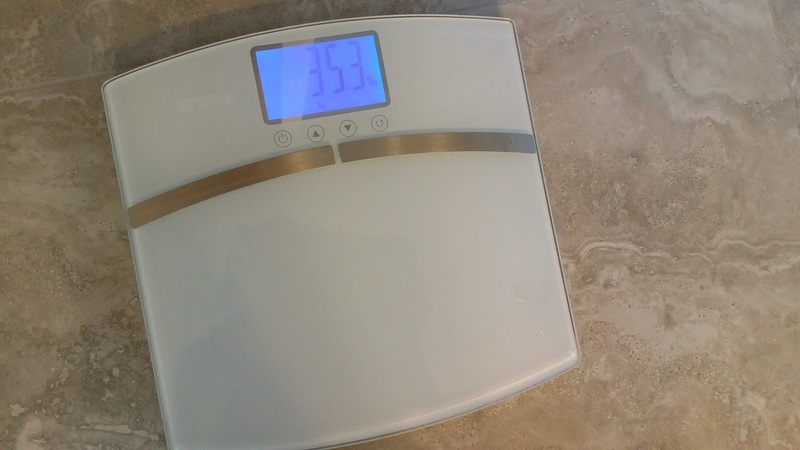 I would like to try this scale as im very health conscious and do gymming regularly, i would like to keep track of my health and weigh myself so that i feel im not putting on weight. i learnt that EatSmart Precision Tracker Digital Bathroom Scale helps one motivated to loose weight by displays the users’ current weight, weight change from the previous weigh in and total change from starting weight. I'd like to try it because it tells you your body fat percentage. I'd love to try this scale because I love that it shows bone mass and muscle mass percentages. Especially since my husband has really big bones, it's hard for most scales to read his body fat correctly. I would love to try this scale, because my New Year's resolution was to get healthy this year, and this would definitely help me on my journey there! Would love to try this... unfortunately I live in Canada so cannot enter! I would love to try this because I am curious about my body fat percentage. I'd like to track my body fat percentage! My husband and I are striving to take better care of ourselves. This would be of great help! This would be perfect for weighing my backpacking foods and items. I'd like to try this scale to get information other than my body weight. I'm seeing that as I get older my metabolism has slowed but that doesn't mean that I'm less fit. Sometimes we carry extra weight but that may be due to an increase in water from too much salt. Plus, I'm kind of a nerd when it comes to trending data about myself! 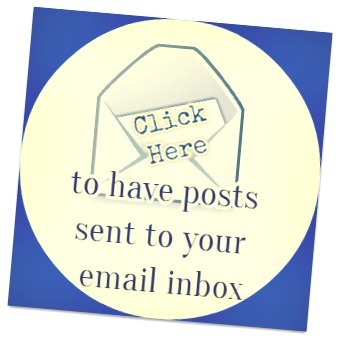 The Overnight Oatmeal Post from the end of January was awesome, I love oatmeal and got some great ideas. The Overnight Cherry Almond Steel-Cut Oatmeal looks amazing! I'd like this scale because it would make it easier for me to keep track of my health, and I am inflicted with CFS/ME and Fibromyalgia. 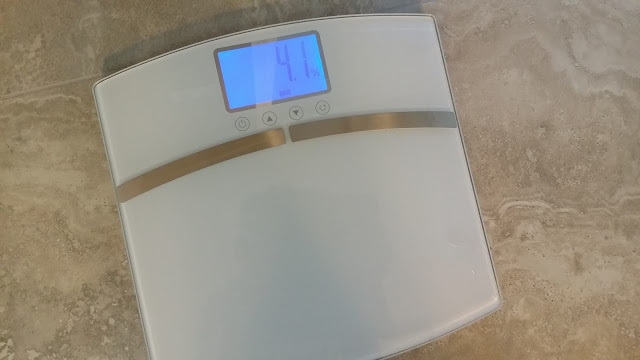 EatSmart Precision Tracker Digital Bathroom Scale sounds amazing to use and the Dr wants me to lose some weight so this would be great to keep track of it with. 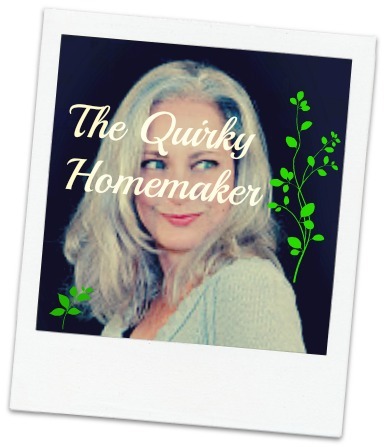 I checked out the Blog and found a recipe link for Mango Passion Jam, sounds yummy right...and its easy to make! I found a recipe for strawberry applesauce that sounds really good. I vaguely remember my grandmother making something like this when I was a child. I really could use help with my portions. I'm not vegan but the Vegan Chocolate Truffles on the blog look delicious! They would make a great Valentine's Day treat. I think this could definitely help me as part of my dedication to upping my fitness game in 2016. There is a great recipe for grilled salmon with an avocado salsa. Salmon is one of my favorite dishes, a great superfood! I would like to know my body fat percentage instead of just how much I weigh. I think it's interesting that the scale can calculate Bone Mass Percentage too! I read an article about Joseph J. Airdo, he lost 100 lbs. by exercising regularly and changing up his diet. He is still able to enjoy the foods he loves but does so in moderation. I am trying to lose weight and it would help me achieve that goal. There is a great article on the EatSmart Blog about marathon nutrition that was just published yesterday. I already follow a lot of the suggestions but definitely learned something new. I have a couple of marathons this spring so the article was made for me! I've been really working on getting into better shape. I love that this scale will tell me more than just my weight! I've been dieting but also been going to the gym more and the scale hasn't moved. I would love to see how much more muscle weight I am. I would love to try this to get an idea what I need to work on. I learned the scale has a 2 year warranty has a manual that explains everything and comes with batteries. I would like to try this scale to help live healthier! I found the Get Lean in 2016 Instagram Contest, it run until the end of February! There's an older post for Melting Sugar Cookies that everyone should check out, my kids would love these. With winter still here it would still be appropriate to make them up. I think it would be so helpful on my weight-loss journey! There is a great looking recipe link on the EatSmart Blog for a heart healthy fruit salad with strawberries, raspberries and blueberries. It also has a bit of lemon juice, basil and my favorite sweetener...HONEY! There is a great recipe for Toasted Coconut Macadamia Chocolate Bars, they look delicious. Probably not the healthiest thing on the blog but if one was to splurge it sure would fill the craving! I would like to use this scale to use to guide my weight loss journey and to determine my progress. I would love this to help. I'm Currently pregnant, and Drs put me on a diet because i can't get past a certain weight due to health problems, or theres higher risk to baby and I. Also, after I have baby this will be helpful to getting back to where I need to be! I would like to own this scale because I follow a low carb diet and its frustrating when the scale won't budge but it's important to have all the numbers because your weight can flucuate by at least 5 pounds throughout the day due to various reasons. I think it would be nice to have just to stay on track of your body while trying to lose weight. I would also like to get one of their digital scales for my kitchen. I am into heavy weightlifting, and this would be perfect to track muscle mass percentage over time!